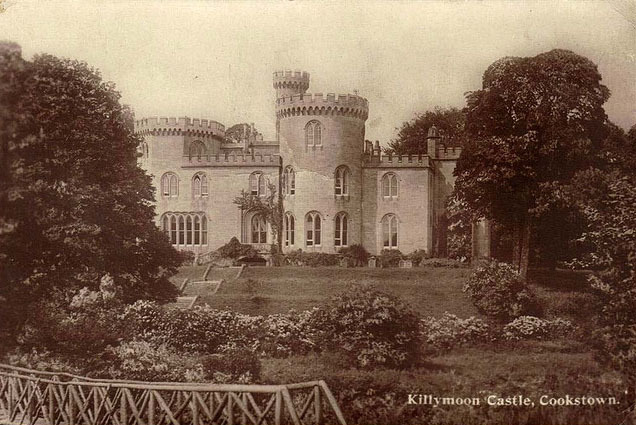 Killymoon Castle is one of John Nash’s earliest castles, built ca 1803 for William Stewart MP, incorporating part of the previous house which was burnt ca 1800. 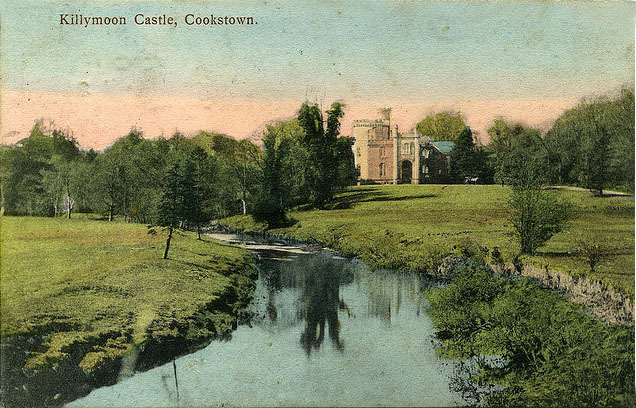 Built on a much grander scale than its predecessor; thus, by its completion in 1803, the castle is reputed to have cost the then vast sum of £80,000. A two storey structure, it is irregular in plan, with the entrance located on the east front. The castle is flanked by towers of which no two are the same. The principal front is dominated by a battlemented, machicolated round tower and turret; at one end, an octagonal tower with similar features; and at the other end the profile of the square tower in the adjoining front, the base of which is arched to form a porte-cochére. The latter tower has slender, octagonal corner turrets with cupolas. There is good interior planning with square, circular and octagonal rooms fitted together. The hall has a double staircase and is lit by a Gothic lantern on a plaster, fan-vaulted ceiling.